One of the most important elements of the new dynamic is being created by activists constituencies. There will be the need for future leaders to recognize and to anticipate this force. No surprise, many will say. 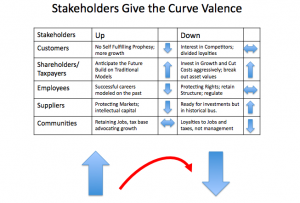 There has been a need to recognize multiple stakeholder constituencies in the past. After all, there are functional specialties within the typical firm to manage customer experience, shareholder issues, labor relations, supplier management and so forth. These functional specialties will only become more sophisticated as stakeholders become more active. But what makes this process of communications important to the stakeholders is that the stake are getting bigger. As markets change more rapidly and corporations and others are forced to adapt and to transform, it’s going to be clear to the stakeholders that they will want to have a greater voice in strategic decisions. Likewise, the traditional business functional leaders who have historically managed stakeholder interests that the activists need to be better connected to the strategic thinking of the organization. Unfortunately, what will make the communication process more complex will be the fact that the agenda of the individual groups will change as the organization moves through the stages of transformation. When it is clear that a change may be coming, but that it’s not likely to come soon, employees and customers can anticipate the ominous future but like residents living on a floodplain they will not necessarily act to protect themselves. As the necessity for action comes, the stakeholders will divide between those who understand the future and want to shape it and those who have different strategies. Many don’t want to hear about negative trends they they view as self-fulfilling prophecies. Others may recognize the direction of the future but do not want to lose the protections that the traditional enterprise has provided. Agendas change from anticipation to engagement to avoidance depending upon the way in which the activists may shape there actions to deal with the necessity of change. An example makes the issue clearer. Stakeholders who believe that they don’t have a choice, who will be punished by the negative consequences of decline want to protect themselves. Those who have a choice will calculate that to eir interests and move to alternative products and services. It’s important to understand the stakeholders and their voices. In simple terms, the up slope and that downslope required different muscles. Those on the rise have different priorities from those who are descending. The curve acquires valence as it reaches the inflection point and turns downward. You are so awesome! I do not believe I’ve rea through something like this before. So nice to discover someone with some genuine thoughts on thjis subject. is neefed on the web, someone with a bit of originality!